Curd is an unfortunate word. Especially for something as lovely as when it comes in fruit form. This recipe caught my eye by the gorgeousness of the color of the curd alone. Gem-like and rich, I imagined how good something this pretty might taste. The original recipe appeared in the New York Times and calls for a hazelnut crust. However, when I went to buy my nuts, the nice lady restocking the bulk bins informed me that she’d seen nary a hazel or macadamia nut in weeks. I was undeterred. As we were chatting, I spied whole blanched almonds. Skinning hazelnuts is not my idea of a good time so I took it as win-win. Fair warning. While this is a beautiful dessert (and delicious each of the three times I tried a square just to make sure), it is fiddly. It would be a wonderful addition to a holiday meal if it was your sole charge. However, if you need a dessert along with everything else you are making, save this one until Valentines day. Or, get someone else to make it for you. Because I had an extra bag of cranberries, I decided to sugar some for a garnish. Not necessary, I promise. But seriously, this color! My crust was a little thicker because the recipe calls for a 10 inch tart pan and the one I used was 8. So, while not as refined as a traditional tart, the trade-off was even more rich almond shell in each bite. 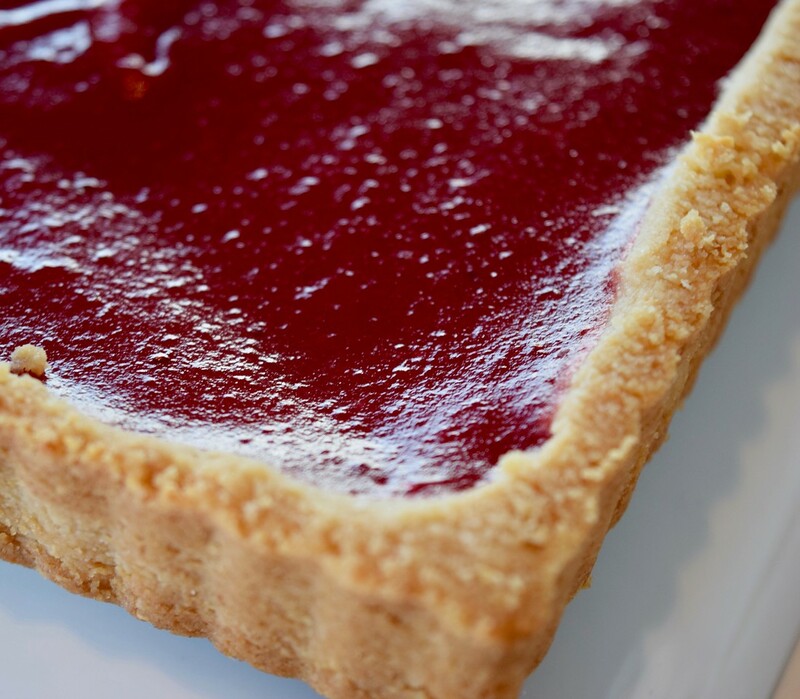 The original version of this tart came from the New York Times. Like the recipe however, the NYT can be fiddly about letting you behind their firewall for recipe content. I don’t believe in secret recipes so while I’ve attributed to the original below, I think I’ve made enough changes that they won’t arrest me. Make the crust: Heat oven to 325 degrees. 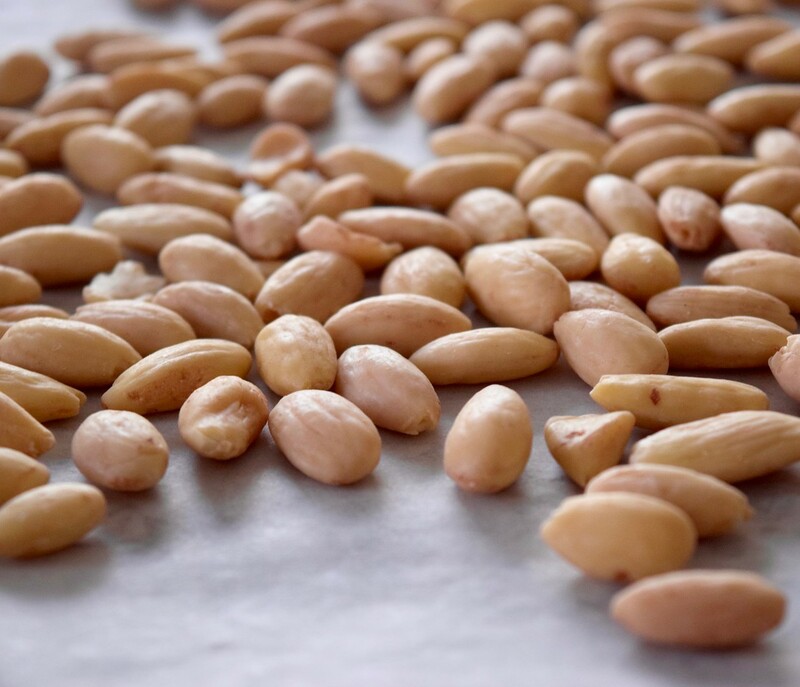 Put hazelnuts (or almonds) on a baking sheet and roast for 10 to 15 minutes, until skins darken and crack. Put roasted nuts in a clean towel and rub off skins. Discard skins and let nuts cool. In a food processor, grind nuts with half the rice flour until mixture resembles coarse cornmeal. Add remaining rice flour, salt and sugar and pulse briefly. With the processor running, add-in butter a few pieces at a time until the dough just comes together. 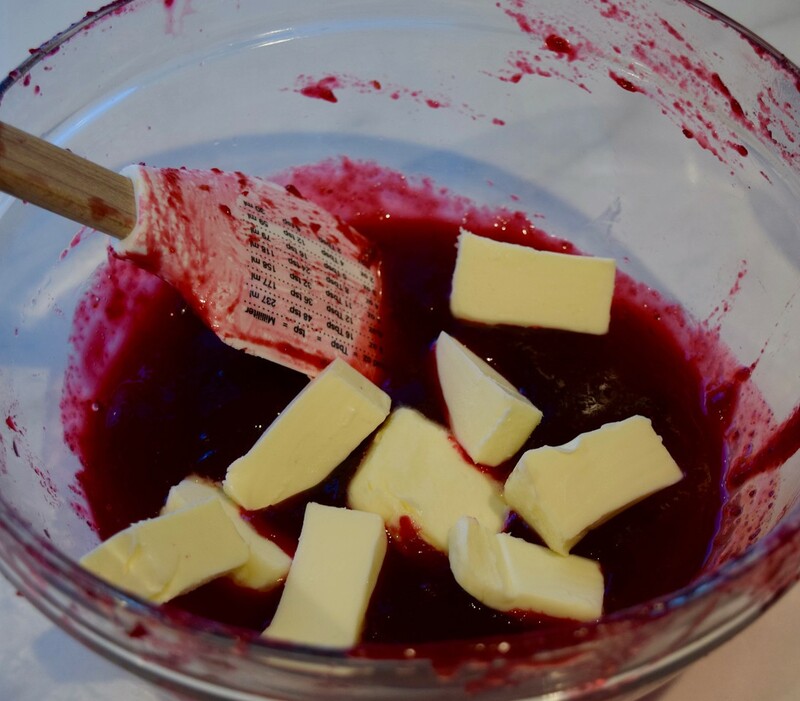 If it seems crumbly, add 1 to 2 additional tablespoons softened butter or a little cold water. 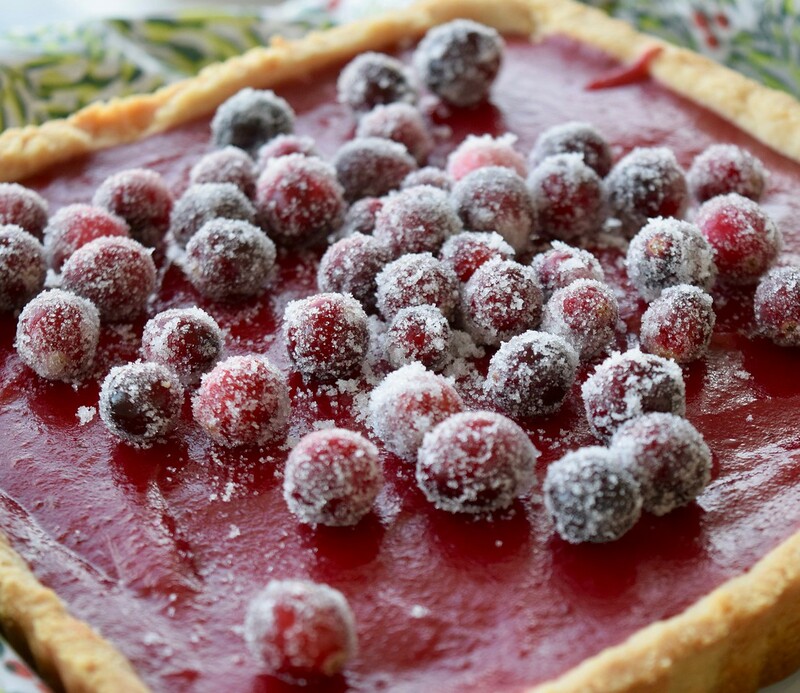 Press dough evenly into a 10-inch French tart pan; use half the dough for the sides and half for the bottom. Prick bottom with a fork and freeze for 30 minutes (or several days if desired). 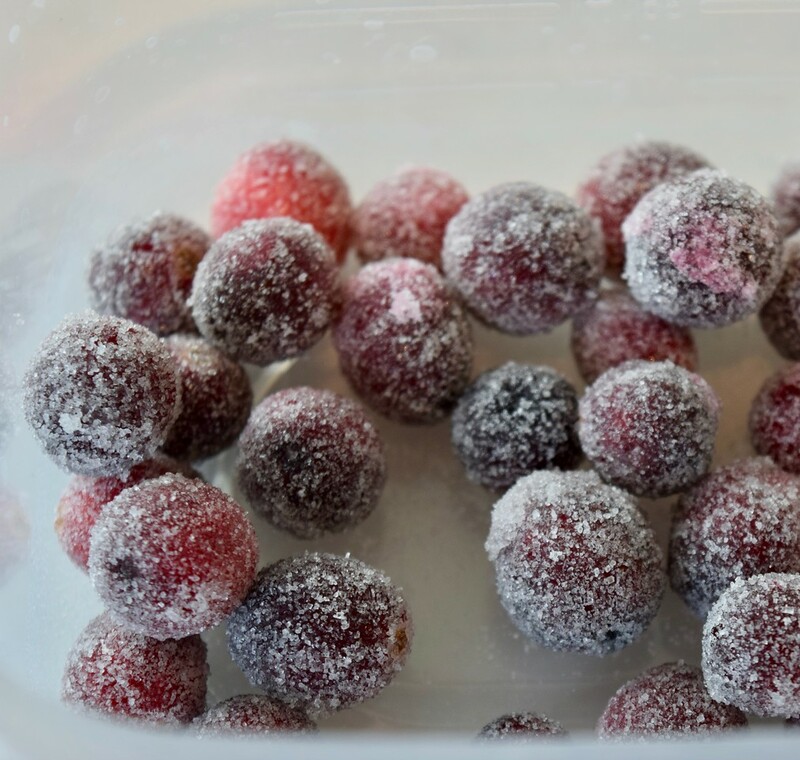 Make the sugared cranberries (skip ahead if you aren’t doing this). Combine sugar and water in a small sauce pan, stirring until sugar is disolved. Bring to boil and add cranberries. 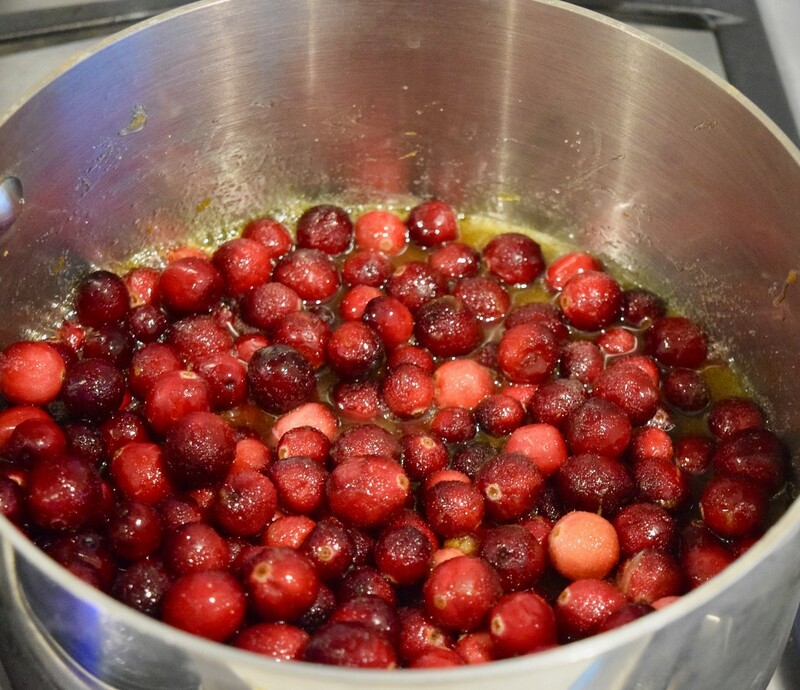 Remove from heat and place cranberries on a cooling rack over a sheet pan (or parchment to catch the excess syrup). Allow to sit for at least an hour. Add remaining sugar into a small dish. Toss cranberries to coat. Heat oven to 350 degrees. Bake chilled tart shell about 15 minutes until lightly brown. Cool. 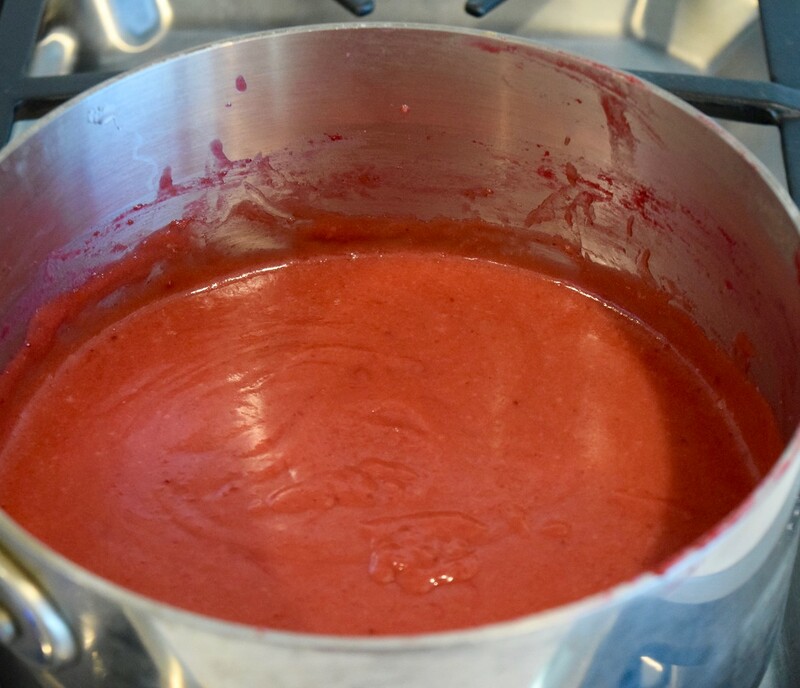 Make the cranberry curd: Put cranberries, sugar and orange juice and peel in a saucepan over medium heat. Simmer until cranberries have popped and softened, about 10 minutes. Transfer to a food mill or medium mesh sieve and press cooking liquid into a bowl. Whisk the butter into the warm liquid. 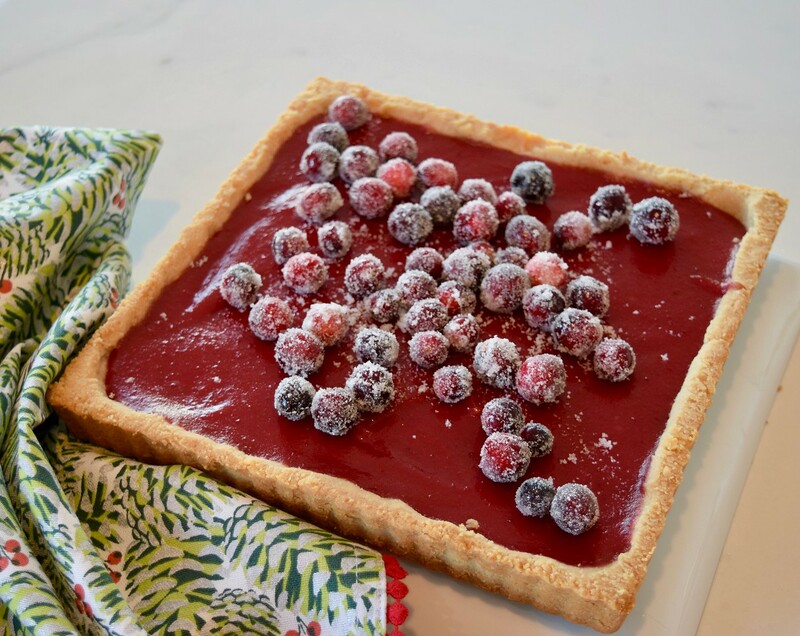 Pour cooled cranberry curd into the cooled prebaked tart shell and smooth top with a spatula. Bake at 350 degrees for 10 minutes to set curd. Cool on a rack. Store at room temperature for up to 2 days.